I know that we're in the baby business, but I was still surprised by today's turn of events. 1:12 pm - Penny calls from St. Paul's hospital. Apparently, her baby may be arriving sooner that she thought. 3 weeks sooner...she's may be having a C-section this Friday. That's in 2 days! 1:14 pm - Bob calls to let us know that Hana is being released from the hospital early. This Friday. Let me repeat. That's in 2 days! I'm still in a little bit of shock. Imagine what Penny, Ken, and Bob must be feeling! Yes, the Easter Bunny came! Looking for some Friday night entertainment? My choir director, Tracey, is singing at a local Vancouver coffee house. She's planning to start her own blog soon, so if you are a music lover, stay tuned! Fri April 1: FIRST FRIDAYS COFFEE HOUSE features TRACEY CLASSEN and QUATRO. Tracey offers jazzy pop original songs; together with singer Eileen Albang and guitarist Earle Peach, the vocals are stunning. Quatro is Barbara Jackson, Niki Westman, Elliott Dainow and Earle Peach. This a cappella quartet emphasizes harmony and mood in an eclectic collection of found, altered and original arrangements. Join us for ERITREAN SUPPER ($7) at 7pm. Find us JAVANET: 3436 West Broadway, 1/2 blk east of Collingwood. Music from 7:30 - 9:30. With all that's been going on these past two weeks, I've definitely been neglecting my blogging duties...thanks, Tomi! Oliver has been spoiled with, to date, three birthday bashes! A surprise visit with Aunt Tricia, Cousin Keenen and Gram on Saturday landed him a "dirt and worm" cake and far too many toys and books. 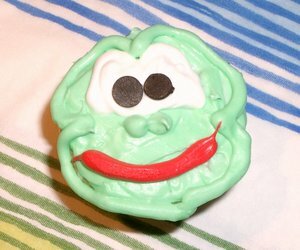 Then his daycare provided the entertainment and birthday crown and I brought a lazy baker's attempt at Froggy Cupcakes. The kids begged for more! Though, it likely didn't matter that they were intended to be frogs...do you think they cared?! Top that off with a most delicious Chocolate Mousse Cake from Anna's Cake House with the Seto clan, more toys and clothes. I think we better cut him off here! Oliver turned 2 yesterday. Did he see his grandparents? Did he eat lots of cake? Did he get some dinosaurs? I believe that the answer is "yes" to all of the above. I was hoping to read an account of the birthday bash, but Penny's been busy attending to both businesses: Milk Factory and the new baby. She may be finding out the gender of the baby tomorrow...stay tuned. Because so many people want to know how Hana (and Bob) are doing, and so many friends and family members want to participate in their lives, I've started a new blog: All About Hana. Please click the above link to see photos and get the latest news. Today is "Green Day" at both the SFU daycare and the Quayside Children's Centre. Our little half-Irish lass, Ella, will be decked out in her green sweater/ paisley pants combo--that is, if she makes it to daycare. Her cold has now progressed into the coughing, sneezing, runny nose stage. Green stuff everywhere, but not the nice kind of green! The results are in! Ella has been given a clean bill of health. She's moved from being in the 50th percentile across the board, to being at the bottom of the height range and at the top of her weight range for her age group. I guess that her nickname "Shorty" will stick for a while, which is fine with me since that used to be MY nickname. Or perhaps her new nickname should reflect her high tolerance for pain. She cried a bit this morning when go-Daddy-O accidentally whacked her in her face with his elbow, but today when she got a needle in the arm--NOTHING. No crying, no squirming...not even a grimace. She just sat there watching the needle go in, and then said "Ouch" only AFTER I said that she didn't say "Ouch". Brave kid. Braver than me! Hana is now over 5 pounds. She's still just practicing feeding by bottle. Once she's mastered the fine art of simultaneously sucking and breathing, she'll be homeward bound. 2-3 weeks? Or perhaps even sooner. Let's hope that her daddy, Bob, gets some sleep while he can. Ella's made up a new song called "Hana coming home". I hope that she'll be gentler with the new baby than she is with her baby doll! It's not that I'm taking back what I said before. I said that MOST of the time Ella is hilarious...unless she's whining. And it's not just the tone of voice. It's the repetitiveness. The other day, when both go-Daddy and I were home, trying to clean up and make some dinner, Ella was vyying for our attention. I think she was asking for animal crackers. Anmal cwackers? Anmal cwackers, pease? Anmal cwackers, Daddy? Anmal cwackers, Mommy? Anmal c-w-a-c-k-e-r-s!!! We both looked at each other, and then almost simultaneously said, "My God, make it stop!" The question is, how do you make it stop? !